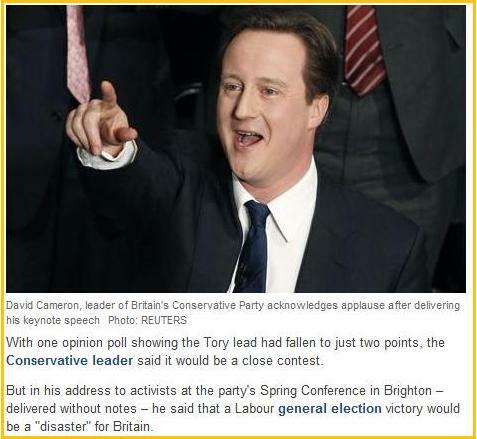 politicalbetting.com » Blog Archive » Will Cameron’s speech prove to be a turning-point? « Remember this after Brown’s first few weeks? Will Cameron’s speech prove to be a turning-point? Will it settle Tory nerves after the narrowing polls? Janet Daley described the speech as “…very good indeed â€“ compelling, coherent and engagingly delivered…” but asks whether Cameron can hold his nerve, while James Delingpole, no fan of the Conservative leader, believes that the speech has “just won Cameron the election“. The speech has had good coverage on the BBC and we await reaction from commentators in other leading media outlets. If the Conservatives do indeed hold on for an election win, will this speech come to be seen as the turning point where the party began the fightback, and put a difficult couple of months behind them?